November 17, 2015 – On its way to higher layers of the mountain where it is investigating how Mars’ environment changed billions of years ago, NASA’s Curiosity Mars rover will take advantage of a chance to study some modern Martian activity at mobile sand dunes. In the next few days, the rover will get its first close-up look at these dark dunes, called the “Bagnold Dunes,” which skirt the northwestern flank of Mount Sharp. 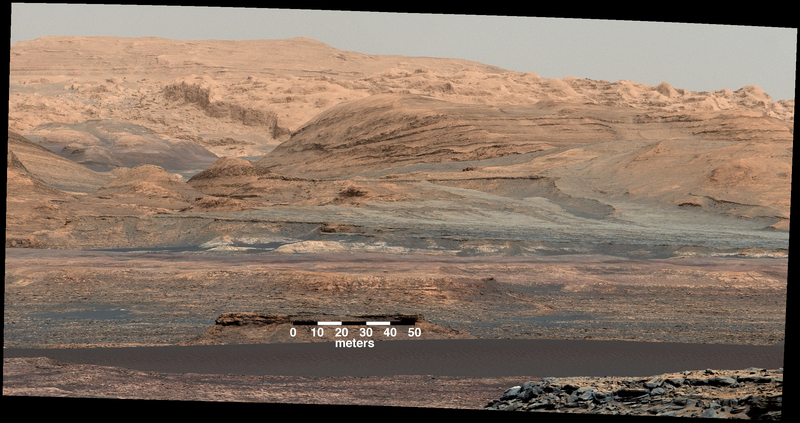 No Mars rover has previously visited a sand dune, as opposed to smaller sand ripples or drifts. One dune Curiosity will investigate is as tall as a two-story building and as broad as a football field. The Bagnold Dunes are active: Images from orbit indicate some of them are migrating as much as about 3 feet (1 meter) per Earth year. No active dunes have been visited anywhere in the solar system besides Earth. “We’ve planned investigations that will not only tell us about modern dune activity on Mars but will also help us interpret the composition of sandstone layers made from dunes that turned into rock long ago,” said Bethany Ehlmann of the California Institute of Technology and NASA’s Jet Propulsion Laboratory, both in Pasadena, California. As of Monday, November 16, Curiosity has about 200 yards or meters remaining to drive before reaching “Dune 1.” The rover is already monitoring the area’s wind direction and speed each day and taking progressively closer images, as part of the dune research campaign. At the dune, it will use its scoop to collect samples for the rover’s internal laboratory instruments, and it will use a wheel to scuff into the dune for comparison of the surface to the interior. Curiosity has driven about 1,033 feet (315 meters) in the past three weeks, since departing an area where its drill sampled two rock targets just 18 days apart. The latest drilled sample, “Greenhorn,” is the ninth since Curiosity landed in 2012 and sixth since reaching Mount Sharp last year. The mission is studying how Mars’ ancient environment changed from wet conditions favorable for microbial life to harsher, drier conditions. 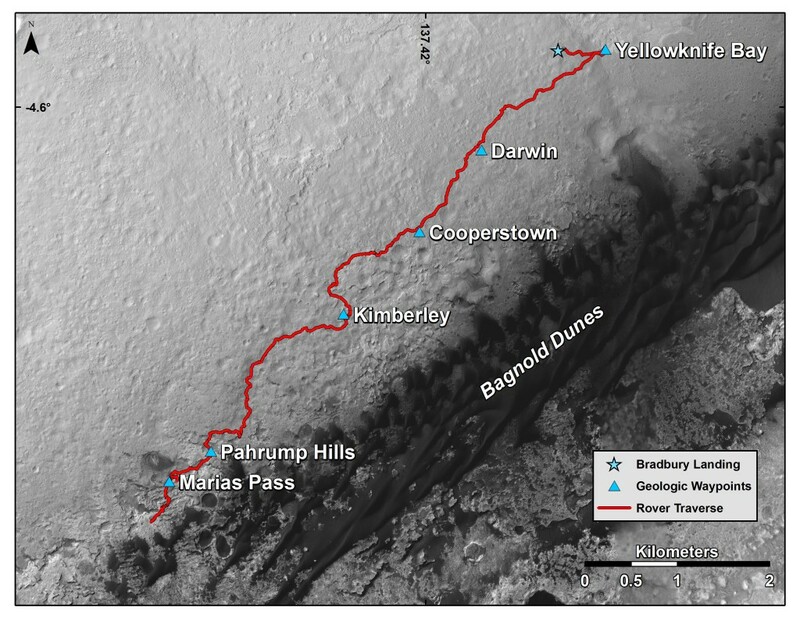 Before Curiosity’s landing, scientists used images from orbit to map the landing region’s terrain types in a grid of 140 square quadrants, each about 0.9 mile (1.5 kilometers) wide. Curiosity entered its eighth quadrant this month. It departed one called Arlee, after a geological district in Montana, and drove into one called Windhoek, for a geological district in Namibia. Throughout the mission, the rover team has informally named Martian rocks, hills and other features for locations in the quadrant’s namesake area on Earth. There’s a new twist for the Windhoek Quadrant: scientists at the Geological Society of Namibia and at the Gobabeb Research and Training Center in Namibia have provided the rover team with a list of Namibian geological place names to use for features in this quadrant. The Windhoek theme was chosen for this sand-dune-bearing quadrant because studies of the Namib Desert have aided interpretation of dune and playa environments on Mars. What distinguishes actual dunes from windblown ripples of sand or dust, like those found at several sites visited previously by Mars rovers, is that dunes form a downwind face steep enough for sand to slide down. The effect of wind on motion of individual particles in dunes has been studied extensively on Earth, a field pioneered by British military engineer Ralph Bagnold (1896-1990). Curiosity’s campaign at the Martian dune field informally named for him will be the first in-place study of dune activity on a planet with lower gravity and less atmosphere. Observations of the Bagnold Dunes with the Compact Reconnaissance Imaging Spectrometer on NASA’s Mars Reconnaissance Orbiter indicate that mineral composition is not evenly distributed in the dunes. 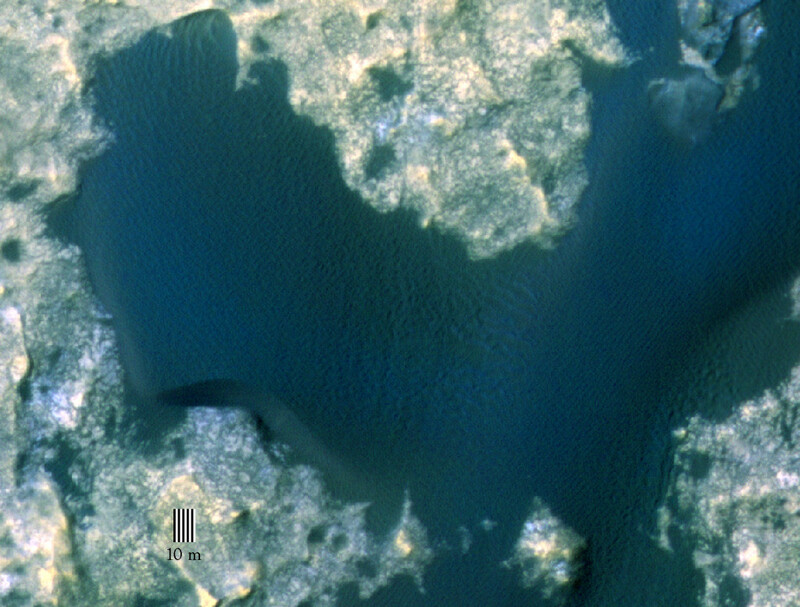 The same orbiter’s High Resolution Imaging Science Experiment has documented movement of Bagnold Dunes. As an example, the dunes contain olivine, a mineral in dark volcanic rock that is one of the first altered into other minerals by water. If the Bagnold campaign finds that other mineral grains are sorted away from heavier olivine-rich grains by the wind’s effects on dune sands, that could help researchers evaluate to what extent low and high amounts of olivine in some ancient sandstones could be caused by wind-sorting rather than differences in alteration by water. Ehlmann and Nathan Bridges of the Johns Hopkins University’s Applied Physics Laboratory, Laurel, Maryland, lead the Curiosity team’s planning for the dune campaign. JPL, managed by Caltech for NASA, built Curiosity and manages the project for NASA’s Science Mission Directorate in Washington.